I’m having a moment of schadenfreude at the recent backlash I’ve seen at the organic foods/eco movement. Or well, not precisely schadenfreude, but the warm glow that comes with seeing someone get a little of the comeuppance you’ve thought they’ve deserved for several years. In among the usual assortment of NYT food article about Farm-to-Table restaurants and the new local food movement in Durham, NC of all places (their disbelief, not mine), and sourcing local chickens for restaurants in LA buried in an Op Ed about Earth Day was a scathing indictment on the dangers of preaching the organic lifestyle. John Tierney’s point being that buying and eating organic local foods and preaching the gospel of organic is a more or less harmless luxury for the developed world. But, when Zambia rejects grain needed to feed starving citizens because it’s been genetically engineered – which, Tierney points out mostly has the effect of reducing soil erosion and water pollution – you have a problem. Equally, if you preach the doctrine that organic is better for you the implication becomes that non-organic produce must be bad for you. Which again, is harmless if you can afford the organic alternative, and is problematic if you can’t because the logical outcome is that people eat fewer fruits and vegetables because they can’t afford the same quantity of the organic variety. On a similar note, there was a lovely article in Salon last week pointing out that a lot of green choices and organic buying are a question of income level. Now, obviously both John Tierney and Ann Nichols have their own axes to grind, and like anyone they’re biased in favor of their arguments, but they do make some good points. I can afford to indulge my bourgeois tastes by shopping at Wilson Farms and farmer’s markets because I’m single and make a decent salary and live in a nice neighborhood. But for a lot of people that’s not true, and adding guilt about buy organic locally sourced vs. non-organic imported apples seems counterproductive, particularly during a recession when people are cutting back on their expenses all round. Rather than suggesting that the only kind of fruit you should eat is organic, perhaps we should be encouraging people not to cut fruits and vegetables from their diets full stop. I like the theory of Sandra Lee’s Money Saving Meals show on the Food Network, but I find it more than vaguely worrying that she never features a vegetable as part of her menus, and if nothing else Jamie Oliver’s Food Revolution suggests that perhaps we should be more worried about people eating fresh anything, never mind whether it’s organic or not. Don’t get me wrong, I believe in the local organic food movement. I don’t know that an apple from Peru is any less healthy for you than an apple from Western Mass, but I do believe that the local one will taste better and is probably better for the environment just because it hasn’t had to come as far, but if your choice is buying an apple from Peru and not being able to afford to buy an apple, I think that the food movement is going seriously awry if you opt to not but the Peruvian apple. Somewhere there has to be a happy medium somewhere between promoting the local organic foods movement, educating about the impact our choices and habits have on the environment and deploying guilt as a tactic that winds up back firing because it makes people make less healthy choices as a result. I came across this recipe for Hoisin pulled pork and the crunchy peanut slaw and was immediately taken with the idea of doing a riff on a good ole Southern pulled pork dinner (yes, this is a sign I watch too much Food Network). I already had the pulled pork and the cole slaw variant. It took a lot longer to find the appropriate side dish substitute. Asian flavored baked beans are not something I could find, not even with the amazing powers of the internet and I was surfing for Asian inspired potato salad recipes when I ran across the sweet potato salad recipe which was perfect. Rub the pork all over with salt and pepper and place in a dutch oven. In a small bowl mix the smashed garlic cloves, grated ginger, ¼ cup of hoisin sauce and 1 Tbsp of soy sauce. Mix together and then rub all over the pork. Pour ½-1 cup of chicken stock (or water) into the bottom of the dutch oven – just enough to cover the bottom so that it doesn’t burn. Cover the dutch oven and roast in a 325 oven 2-3 hours or until the meat falls apart at the touch of a fork (or in a slow cooker for 8-10 hours on low). While the meat sauté the garlic and ginger in a small saucepan and then add the hoisin sauce and soy sauce. Bring to a simmer and cook for 10-15 minutes over a low heat, stirring often to make sure it doesn’t burn. Season to taste with salt/pepper/more soy sauce. 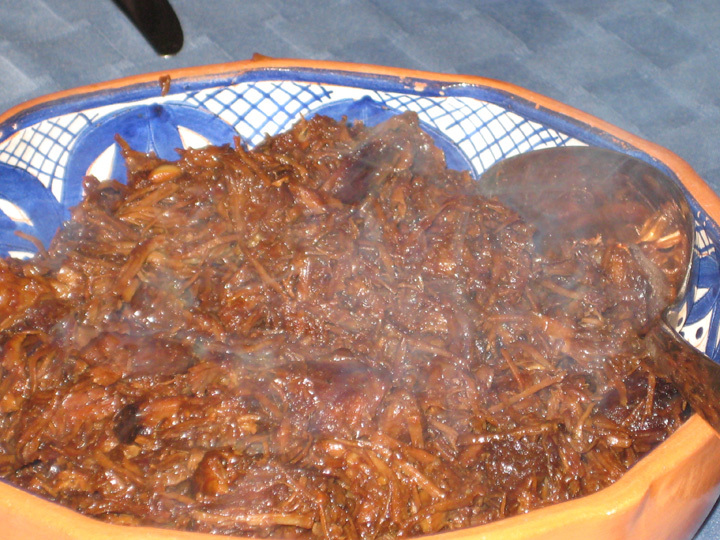 When cooked and tender use two large forks to shred the meat and mix in with the sauce (start with a little and add as necessary). Can be made 1-2 days in advance and reheated. Serve with small wheat tortillas and slaw. * The original recipe calls for this to be made in a slow cooker and I suspect that the lower temperature in a slow cooker means that the meat juice and the hoisin mix and make sauce. If you’re making it in a dutch oven the hoisin just burns. So, if you’re making it in a slow cooker mix all the ginger, garlic and hoisin sauce together and pour over the meat, set the timer and walk away. If you’re making it in a dutch oven just rub your meat with the sauce to create a crust and make the rest of your sauce separately. Notes: This runs the risk of being very hoisin-y. That’s not necessarily a bad thing, I love hoisin but it does have a very strong, very distinctive flavor, so a little sauce will go a long way, although the peanut slaw goes a long way to balancing out the sweet of the hoisin sauce. Also, if you can find small tortilla wraps more power to you. I couldn’t and used lavash bread instead – I was feeling vain so I actually cut them into circles by tracing around the edge of a small bowl with a knife, but that’s unnecessary. 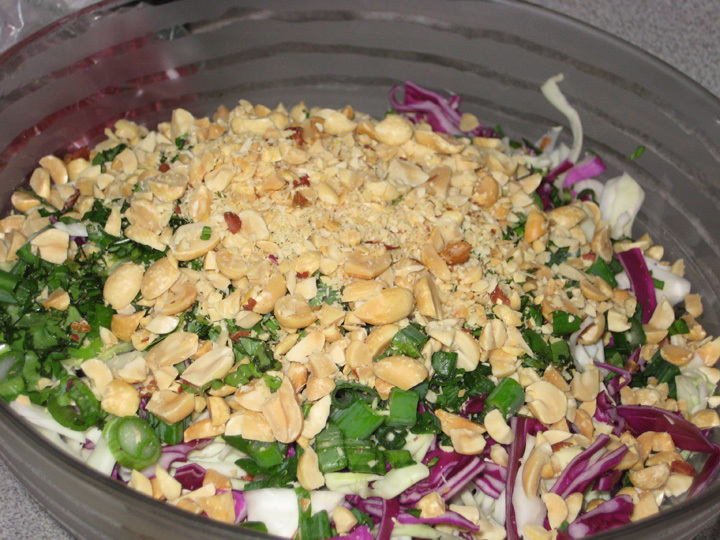 Mix the cabbage, peanuts, scallions and herb of choice together in a bowl. Season lightly with salt and pepper. Whisk the dressing together and toss with the cabbage (I used a little over a half of the dressing – and next time I’d use less oil and more vinegar to give it a little more kick) . Garnish with a few more peanuts. * If you don’t loathe cilantro as much as I do – and apparently I can stop feeling like this is a moral failing on my part because the NYT tells me it’s genetic you can use cilantro instead (it is, in fact, what the original recipe suggested). Put the sweet potatoes and onions on a large baking sheet and drizzle with the olive oil. Season with salt and pepper and toss to coat. Roast in a 400 oven for 30-40 minutes, turning occasionally until the sweet potatoes are cooked through and beginning to brown. 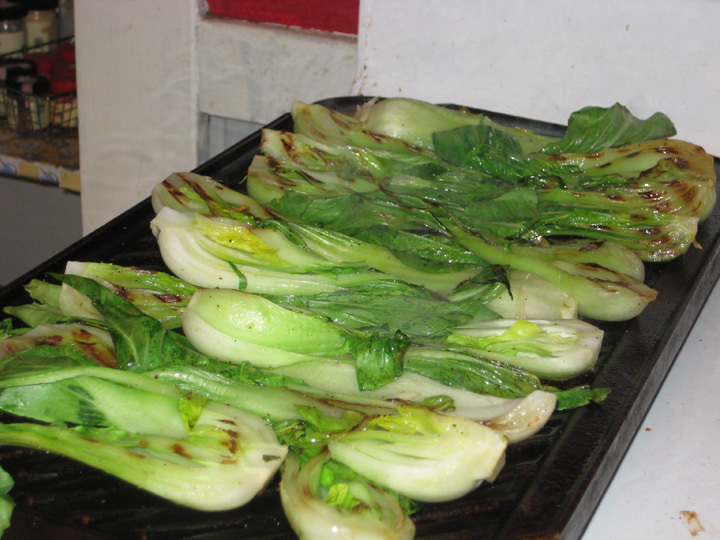 Remove from oven, keep on pan until ready to mix with dressing. Put all ingredients in a blender and process until blended. 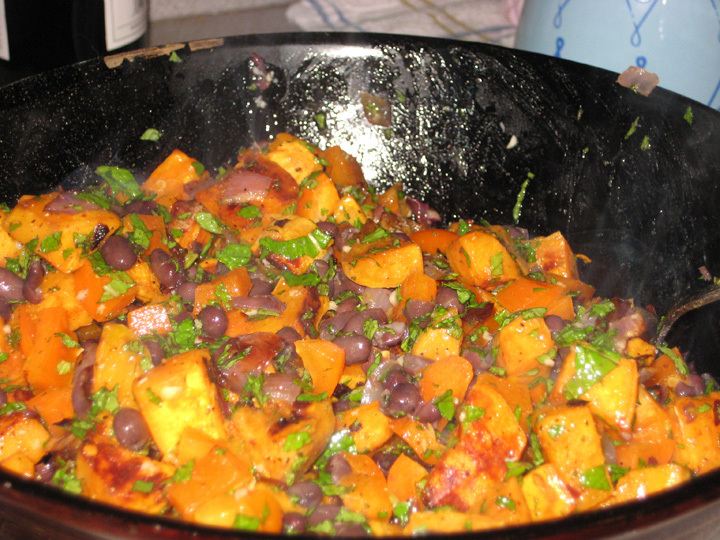 Put the warm sweet potatoes/onions in a large bowl with the black beans and bell pepper and toss with the dressing and mint/cilantro (I didn’t use all the dressing, and next time I think I’d cut back more on the oil and up the amount of lime). * If, like me, your jalapeno mysteriously goes missing between the grocery store and your house, sprinkle the sweet potatoes with some red pepper flakes before you roast them as a quick and dirty substitute. Notes: In the summer I bet this would be really good with some roasted corn thrown in for extra color and crunch. I thought I was the only one in the world who wants to pick out all the cilantro from her food, even when it’s minced. Good to know that tendency is my parents’ fault. Also: Williams Sonoma has Le Creuset Dutch ovens on sale this weekend. Do I really need one (I want one because they have one in yellow, but need one?) or will the slow cooker I already own suffice? Well I’m always seduced by the Dutch Oven colors. It depends on how much you use your slow cooker, and whether you ever find yourself going to make something and having your hopes dashed by a lack of an oven safe pot. You might be interested in an Oxford-style debate we went to with the motion “Organic Food is Marketing Hype.” Before the debate, 21% of the audience voted for the motion, 45% against, and 34% were undecided. After the debate, 21% were still for the motion, 69% against, and 10% undecided. We voted for the motion both times, but we think the audience was stacked against it! We have been to a series of these debates (sponsored by Intelligence Squared U.S.) and this is the first one where each side (three debaters on each side) seemed to have real animosity to the other side. If you are interested, you can read about it at http://tinyurl.com/y5mkpmg.